The International Institute for Strategic Studies (IISS) is a research institute based in London, with offices also in Washington, Singapore, and Bahrain. The Institute was established in 1958, and is dedicated to delivering unbiased, analytical research specialising in international security and conflict. The IISS has published its trusted Military Balance book since 1959. The Military Balance is an annual assessment of global military capabilities and defence economics. With no pre-existing digital version the book has now been made available as an online relational database named Military Balance+, which represents a step change in defence analysis. Complex database contains a series of modules which stores data on forces, equipment, defence economics and procurement for 171 countries and selected non-state armed groups. 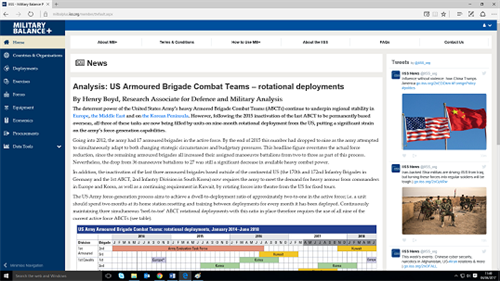 Content management system, to allow IISS analysts to create, approve and publish new data content with versioning control. Subscriber online dashboard available in corporate and individual licence formats. The new database allows subscribers a simple way to compare data sets, such as defence budgets across the world, year by year. Alongside this, a data analysis tool is provided, by which economies, equipment, forces & personnel can be compared and displayed in user-friendly charts and tabulated format. For corporate members, this data is downloadable and can be exported into Excel, anytime, anywhere. The dashboard has been built for desktops and can be accessed through a browser www.iiss.org/militarybalanceplus. It is expected that this new product will transform the way that IISS is able to communicate its data and facilitate faster and better-informed decision making. Worldwide access – allows data to be viewed, compared and downloaded anywhere, anytime. Frequently Updated – IISS analysts continually monitor developments, assessing and integrating relevant information as soon as possible. 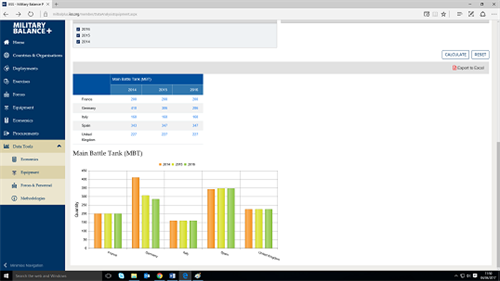 Instant Comparisons – data analysis tool allows for quick comparisons of defence information.